This movie got “The Welsh BAFTA Award” for Best Picture, Costume design and music, and the “British Independent Film Award” for “Filmmaking Within a Limited Budget”. Knowing that, and after watching the trailer, my expectations were pretty high regarding “The Machine“. And these expectations were largely redeemed. 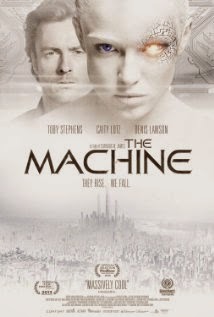 “The Machine” is a dark SF where the main focus is the development of an artificial consciousness and not the use of flashy futuristic action with dazzling laser battles. Although it’s a low-budget film, the sober SE’s were convincing . Not overdone but still influential. It gave me the same feeling as when I saw “Blade Runner“, “Terminator” or “Star Wars” for the first time. It’s not a film that will have a big influence on future SF movies, but overall it was acceptable. The trailer looked more overwhelming then the end result. It looks rather flashy and impressive. An adrenaline boost is felt noticeably after you’ve watched it. The content however matched the trailer, but that adrenaline boost failed to materialize. It had been a while since I had seen the trailer. At one point I even thought I was watching the original movie and the trailer was from the remake . Vincent (Toby Stephens), an expert in the field of artificial intelligence, is working for the British Ministry of Defense (MoD) in a heavily guarded bunker complex and provides soldiers with brain damage of an implant such that they are functioning back normally. Working for the MoD is against his principles, but is a way to have the right resources to possibly help his own daughter, who has a congenital brain damage. As a kind of Frankenstein you see him admire the result in the opening scene with a “repaired” ex-military that ultimately ends in a fiasco. Eventually, the rising star in the field of AI programming, Ava (Caity Lotz), is recruited to strengthen his team to help design a super-computer with a self-evolving consciousness . The combination of a autodidactic software developed by Ava and the ability to design limbs with superhuman powers, can lead to a sort of Robocop-like creatures. Before you know it, Ava dies because of fatal injuries and Vincent sees an opportunity to create an android based on her image and brain scans. Ultimately, the MoD is only interested in making a controllable and manipulable super-soldier. “The Machine” questions the principle of artificial intelligence and the human intervention on soldiers with brain damage who are then separated as soulless outcasts into a hermetically sealed part of the military complex. Is it possible to design an independent thinking artificial machine ? How can you keep this under control without it transcending humanity and ultimately being a threat to the excistance of the human race ? You obviously will associate the content with “Robocop” and “Terminator“. The soundtrack creates an atmosphere like in the SF classic “Blade Runner“. Witty and sober. A minimalist decor of the area and the cold metallic backgrounds. All this makes for a cold and sterile atmosphere. With therethrough extremely realistic high-tech appliances. The effects that were used were actually extremely clever applied, despite being a low-budget SF. The creation process of “The Machine“. The flashing of it’s nervous system. The piercing luminous eyes of the ex-soldiers who function thanks to the implant.Everything is subtly incorporated into the film and gives the illusion that you’re watching a SF with a significant budget. An admirable achievement. It surely is a UK product. You notice this immediately because of the un-American ending. No heroic victory at the end with a patriotic cheering crowd. Rather a dark and depressing doomsday scenario that hangs as a curse over the further computerizing humanity. Caity Lotz is the revelation of this movie in her dual role as a scientist and created robot. Beautiful expressions and breathtaking interpretations. The gradual transformation of a fairly infantile acting android to a cold-blooded and responsive artificial intelligent person, is played by her in a wonderful way. The eagerness with which “The Machine” wants to understand human nature and the urging to be respected as a member of the human race, is fluently and accurately mapped. “Apart from their flesh, what makes them any different than me?” she asks in a harmless and disarming way at a given time. Her outward change of a smooth, sleek-haired, smiley girl into a expressionless face with a gel-slicked hairstyle is fairly successful. A personality change by means of a tiny detail. Toby Stephens portrays the somewhat tormented scientist Vincent. The relationship that develops between him and the android is that of creator vs. creation. An educational task that gradually turns into a more deeper trust, of which you could wonder if it would turn into a romantic relationship at some point . Stephens role tends sometimes to become pathetic but personally I liked the moments when he subjects a software designs to a “Turing test”. It was entertaining and he shows the analytical skills he has as a designer of AI computers. Denis Lawson plays the indomitable superior Thomson who has only one goal in his mind, namely creating an invincible fighting machine. “The most technologically advanced society always wins” as he notes sober and businesslike. Besides the sullen and dogged look there’s not much to tell about this character. The only less successful part of this film are the sometimes amateurish action/fight scenes. Especially when Ava comes into action. Then it looks rather improvised and hesitant. The movements aren’t really smooth and there’s a “wait and see” attitude before the next opponent is attacked. And that’s sometimes a bit to much.There’s however one perfect moment when she floors a reasonable big guy with an upward straddle against a wall. Respect!